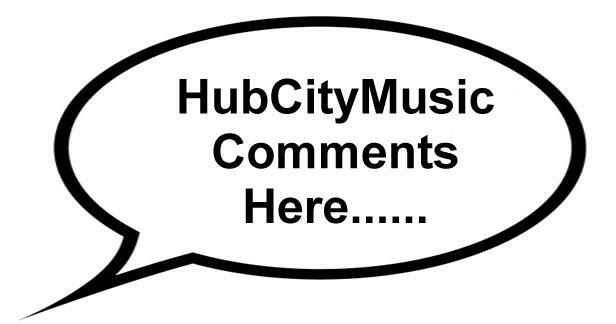 You can view every comment made to HubCityMusic on this page. Please visit you favorite pages and leave comments. It means a lot to the musicians and bands to hear that you enjoyed them back in the day. To leave a comment: Go the page of your choice and enter your comment at the bottom of that page. Your comment will then appear on that page and also in the master list below. Clorisa on Rock MusicThe Midnight Riders had a poster that had a rearing horse coming out of a cresant moon. I remember tracing it when I was young. My father Rich Brown played . Kelly Mendez on Bobby Hankins ShowCurt Noack on the piano (far left) in picture requesting names. Curt Noack was my father and spoke fondly of playing with Bobby. indianakelly on BH Basement TapesI have a friend that says he might have some more cassettes. We will take all we can get! indianakelly on BH Basement TapesGood times indeed. Great to hear from you Johnna! Johnna on BH Basement TapesOMGOODNESS ! I was back at Wildweed! Good times! indianakelly on BH Basement TapesThank you Chris! Your cousin Tate could really lay down the bass line. Chris Gonterman on BH Basement TapesI love it! Took me back to good times and great music. I really like the different parts of the songs are described before you listen so you can try and hear it. Great stuff! Kathleen Jennings on Keith Thompson TrioWhere was Keith Thompson from, was his hair red, did he have a second job and did he play in Oelwein in the late 40s? indianakelly on Coliseum BallroomDoc and Sharon, HubCityMusic thanks you for your kind words. This is the first time we heard of the Trolians band. If they played the Coliseum, they must have been good. Also, many thanks for Dave Moore on his efforts in the restoration. John on Terry WheelerTerry use to play in our bar/restaurant in Grand Lake, Co. We loved listening to him and knowing him. Pure enjoyment! We often think of Terry. Seth Vargason on Al RicchioDon't forget Mike Ricchio, he passed away today but he told me of many times playing on the road with his dad. Virginia Foy on Bill ReintsThank you for this article. I thoroughly enjoyed it. Brings back many memories. Chad on Bobby Hankins ShowHello. My dad was Keith Thompson. If anyone had pictures could you contact me? indianakelly on Coliseum BallroomTerry Knapp - I will email you to get a copy of that postcard to share on this page. indianakelly on The PlainsmenThanks Jeff! I have updated the page with the names you supplied. Can you provide any more info on the band? Jeff Baker on The PlainsmenNames for picture above. Ed Kammer, Steve Bachman, Larry Donaldson . Left to.right . Then Chuck Baker in the. Front. Chuck is my father. SHELLY on The Blue FlamesI always thought my dad walked on water and I think everyone who knew him thought the same. Norman David Peterson JR. on The Blue FlamesMy Dad was Norm Peterson. He learned to play 11 instruments during his career as a musician. He loved his music. The last 5 years or so he started doing Gospel. I really enjoyed this article and my Dad would have too. Jolene (Cherrier) Rhea on The Blue FlamesYes, that was my family. Dad, Mom, me and my younger brothers Steve and Mike. indianakelly on The Blue FlamesHello Jolene, I learned how to play country guitar by sitting with PeeWee in his back yard workshop on the west side. I later lived on 3rd Ave. S.W. about 3 blocks west of Sacred Heart. There was a Cherrier family that lived across the street from me. Were they related to you? Jolene (Cherrier) Rhea on The Blue FlamesI am PeeWee's granddaughter. I remember the Andy Doll Band and the Blue Flames. Grandpa (PeeWee) and Grandma used to come to our house with their instruments and my mom and dad and them would all play (Dad played steel guitar and Mom played bass) This brought back a lot of great memories. Peggy NIcolay Sherrets on Steve WestpfahlSteve, I remember you guys so well! Such talent! Always had a great time dancing when you were playing. I would listen to you guys before my brother's band!!! Faye Stewart on Steve WestpfahlCongratulations Steve very deserved. Glad Tom and I had the honor of following the band from time to time. Scott Peterson on Randy LandasHi Randy glad to see your doing well remember hitch hiking to Sedalia Rock Festival? Garry Davidson on Coliseum BallroomYour Dad and Uncle Ken were two of my very best friends when we were growing up. Spent many weekends and holidays with the family or they came to visit us. Began our companionship at age 3 until your Dad's passing. Music was our number one interest. We spent hours at the piano. Kathy Jennings on Coliseum BallroomDid he play at Oelwein Coliseum around 1949 and did he have red hair? Gail Alderson on Kelly MurphyThank you, I feel the same. I hope your doing well. I love the pictures. Jeff Davis on Step On ItI know where Gail Hicks can be found if you want to know. Larry Soper on Coliseum BallroomYes I knew your father and mother. indianakelly on Andy Doll BandGary, I am presently working with Bill Reints on the full history of the Andy Doll Band and the Blue Flames. Your name has come up several times. Once I update those pages, I will be sure to let you know. By the way, do you have any pictures of AD or the Flames that you could provide to me to put on this website? Gary Hinderberger on Andy Doll BandA good history of Andy and his band. I enjoyed 2 1/2 years of playing drums on it from 1965 to 1967. Gary H.
Brenda on Terry WheelerThank you! indianakelly on Terry WheelerBrenda - I just added contact info for Terry. Thank you for visiting HubCityMusic. delilahdewylde on Bobby Hankins ShowI'm sorry I never got to meet Bobby, but we have some of his records and they're great. My MIL was married to Bobby for a time. Robin Fortsch on Kammerstock RetrospectiveWas so glad to be there and witness the outpouring and talent. It was amazing. tammy Hallberg on Kammerstock RetrospectiveWhat a great event for the people we love and care for. Many prayers , many thank you, it took a village, for the right cause. indianakelly on Kammerstock RetrospectiveJohn, THANK YOU! The hundreds of photographs and videos you provided made this event live forever. On behalf of all the musicians and event organizers, we are grateful. john on Kammerstock RetrospectiveGreat job on everything Kelly! indianakelly on Bobby Hankins ShowGood catch! It has been corrected. Can you supply names for some of the other pictures on Bobby's page? Rose Kintz publicist for Crystal Axe on Crystal AxeThis is Crystal Axe. Thank you for adding us to Hub City. We have one thing to add. When we were inducted into the Iowa Rock n Roll Music Association's Rock n Roll Hall of Fame of 2014. The line up was Kat Bauer, Gary Berns, Dale DeMaris, Steve Manges, Kent Moore, Harley Sunnes and Brent Woodson. Chad Thompson on Coliseum BallroomMy dad was Keith Thompson. He played piano and sang with Bobby Hankins. If anyone has photos or memorabilalia or even memories say hello. Nycchad1@gmail.com Thanks so much! We miss him dearly. Pam Wenzel on KAMMERSTOCK – Featuring BlueShatterSo excited for this amazing entertainment! What a great bunch! Jean Denbo on KAMMERSTOCK – Featuring BlueShatterI would love to fly in and see my old childhood friend, Mike Fereday, but cannot make it this time. Suezette Walker on Dixie HankinsWe miss you playing with Jody Nix. His music is not as "crisp" as it used to be when you were there. Robin Fortsch on KAMMERSTOCK – Featuring BlueShatterBringing everyone I can pile into my car. Wouldn't miss this stroll down memory lane for nothing. steve bachman on Tom KammerTommy hang in there brother! Wish I could come home for that, would love to jam with with the old bunch. Kathy (Kringlen) Moser on KAMMERSTOCK – Featuring BlueShatterI'll be there for sure!!! Wouldn't miss it for anything!!! Jill Murphy on KAMMERSTOCK – Featuring BlueShatterCan't wait! George Foy on Tom KammerI was terribly saddened to hear of your diagnosis Tom! That's a serious blow that few survive but if anyone can you can. I concur with all the comments that you were and are one of the best drummers around. In my 23 years at Oelwein you were far and away the best! We'll be praying for you. Steve Dougherty on KAMMERSTOCK – Featuring BlueShatterWish I could be there , Nick. I'm proud to see that you are a great and talented person, my old friend. Best of luck in this effort. Don Stohr on KAMMERSTOCK – Featuring BlueShatterIll be there. Wouldn't miss it! Debbie (Albert) Vargason on Blue HorizonThanks Kelly for the memories. The band rocked. Roger Wetlaufer on Tom KammerI am sure I must have played with Tom a time or two as he was one of "the" drummers in Oelwein, and he was in high demand. If Tom was your drummer you knew there was a tight pocket. Always. Pulling for you Tom and sending out good thoughts and wishes to you and your family. Barb Ricchio on Tom KammerTom, I think you are the best drummer my dad (Alex Ricchio) ever had. Hope everything works out for you and your family. You are in our prayers. indianakelly on Tom KammerAw shucks. Tom Kammer on Tom KammerThanks Kelly, I was very lucky to get the chance to play with a lot of great musicians, including you. You were the one who encouraged me to join BH and that was a huge boost in my musical life. You were a great leader and role model for all of us. Thank you! Tom Kammer on Tom KammerThanks Kent, it was probably me who screwed up the schedule! Always enjoyed playing with you and the Basics, no egos, just good times! jere gregory on Jay SielemanBorn in Memphis April 4 1952, watched moon landing July 21 1969 in your folks back yard. Will never forget that! Thanks for the Montana visit. Was fun. Stve Reed on Rock MusicJohn Klink , Rich Brown and Steve Reed, known as Midnight Riders, also played in the Oelwein area. Kathy Jennings on Bobby Hankins ShowHi Dixie! Was your Dad playing in Oelwein in 1949 and did Keith Thompson have red hair or any other band member? Kathy Jennings on Coliseum BallroomDoes anyone remember the name of a band playing in oelwein in early 1949? Steve Jad on Andy Doll BandIt's strange how we don't know someone. Andy Doll was the custodian at our small school in Powers Lake, North Dakota. I had no idea of his background but I wished that I had as I too became a musician leading a band with my guitar. Rest in Peace Andy Doll. Charlie Hallberg on Randy LandasKelly: I was blown away by your story on Randy Landas! You should have been a journalist! Did you do the telephone interview? His "mediocre career" would be a dream come true for the rest of us "musicians" from the big "O"! Fun stuff! keep blogging ! Charlie Hallberg, Hiawatha, IA. indianakelly on Rock MusicAdded a placeholder for them but need more info. indianakelly on Rock MusicAdded a placeholder for Reaper and have been chatting with a band member to get more info. I also added some info for Savenger's but need some contact info to build a page for them. Barb Ricchio on Country MusicYes I am proud of my daddy. indianakelly on Country MusicWow. These songs are priceless. Since I created the HubCityMusic site, is it O.K. if I copy this link and add it to your Daddy's page? Mary Ryan on Randy LandasI remember going to school with Linda until about 6th grade. What a story. Best wishes to the whole family. indianakelly on Blue HorizonYep That was Wheels singing Gently Weeps. Make sure your brother Kevin checks out the page. indianakelly on Rock MusicTony - We need to talk.Are you on Facebook? Message me and we can start building a page. Tony on Rock MusicHey! I used to play guitar in Reaper, and just found this stream. What do you want to know? Tim on Blue HorizonLots of new stuff, glad my Mom told me to go read it :). Gently weeps gave me the chills. Wheeler sing the lead? Damn good whoever.... all helped pass a slow workday today. Thx Murph for the flashbacks! Ray Fisher on J.W. SwiftI replaced George in J.W. Swift, and we also added Mike Faraday. It was a great time, but I wish I could remember the name of our female co-lead singer. john lukehart on Shatteri remember when Shatter played with ONE SHOT DEAL in Marshalltown..
Tom Kammer on Milt CampbellMilt was great to me when I played in the Country Buddies. That's where I met so many of the senior musicians around Oelwein. indianakelly on Rock MusicJames Grob - Give me more info on Scavenger's Daughter and Reaper! Kaylee Foley on Coliseum BallroomI stumbled upon this page while researching Andy Doll. He was my great uncle (my grandma's brother) and he died the year I was born (1984). I have found many audio clips of his music and pictures and stories. I even found a forum with posts by guys who played with him on stage. Very wonderful and interesting stuff, I will certainly have to share with my family. Thomas on Jay SielemanWay to go Jay from a party animal to president / ceo of the blues foundation. isella franceschi smith on Jay SielemanJay I remember you from school very well, you belonged to the popular group unlike me. I love your article, best of all I like that your wife is also Panamanian. Nice to read about successful folks from oelwein. indianakelly on Blue HorizonThank you Terry for your comments. Even though you say that BH let you hang with "you kids", we were only a couple years older than you! We were all "just kids" back then but were bitten by the live music bug that never left us. Wayne 'Bud' Fink on Rob TatroRob came to Des Moines in1994 & I had bought a used Carvin Bass & he helped me master. soarwithexit@gmail.com on Milt CampbellMilt was such a kind and gentle man. Our band (Afterflash) recorded at his studios about 1969 and Milt was so patient with us. I know he is missed by his family. indianakelly on VenuesBy the way, I witnessed Luther Allison that night also. He walked into several bars both to the left and right of the Paddock that night while still playing. And this was before wireless guitars. His guitar cord must have been 500 feet long! Christy Tucker on Blaine FallisVery cool Blaine! Loved reading this!! scott on Jay SielemanI, as your younger brother, is as always very proud of you! Very nice informative article, but I don't remember delivering any catalogs! Christmas items maybe. But anyway - nice article!! Tom Kringlen on Jay SielemanElvin Bishop and John Mayall. Envious. Ann Suffern Anglin on Jay SielemanJay, so very proud of you for what you have done with your life and what you are now doing for the Blues Foundation. Oelwein was a great place to start for all of us!